Obviously I did a lot of work before this week to get ready including creating a Pinterest board, choosing a theme (I will share more tomorrow! ), decor ideas, food ideas, venue etc. so this week is all about shopping and finishing up last minute decor! Load bin with plates, forks, serving dishes, etc. 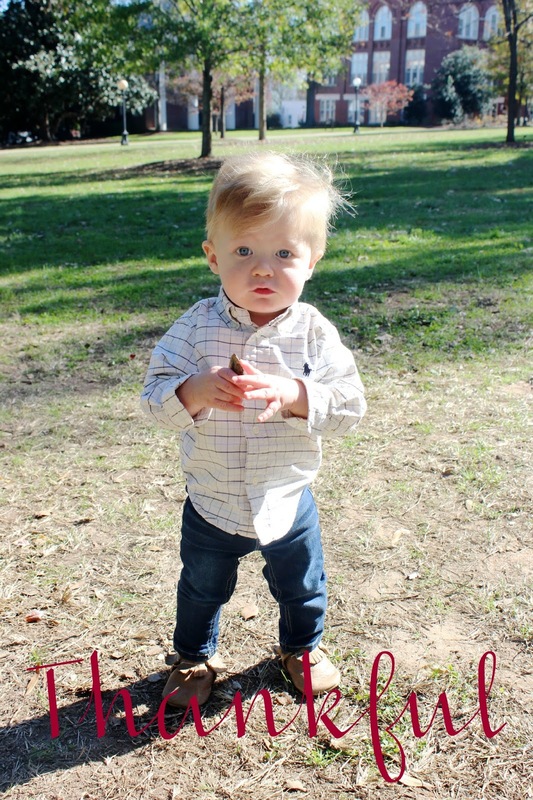 I am excited to get this week going and celebrate our sweet boy turning ONE! Last year Adam and I decided to go for a walk on North Campus in hopes that I would go into labor. Of course it didn't work but we decided then that we would turn it into a yearly Thanksgiving day tradition to go to North Campus with our family. We were excited to get out there with Bennett this year and let him run around. We were blessed with an unseasonably warm day with 70 degree temps so we stayed out there for a while. We are so thankful to call Athens home. We truly could not imagine raising our son anywhere else. We hope that each of you have an amazing Thanksgiving and that no matter what season of life you find yourself in that you can find the time to thank God for the blessings in your life. We know that the holiday season is not easy for a lot of people. I can think of so many friends off the top of my head who are dealing with some really hard things right now. Kiddos in the hospital, those who are facing their first holiday season without a loved one, or those who long to have littles running around their homes. We see you. We pray for you and we hope you know just how loved you are by those around you and by your Heavenly Father. For a few more ideas check out my "Bennett's Birthday Wish List" board on Pinterest. If you missed part 1 of my registry essentials you can check that out HERE. We are so so fortunate to have an amazing sleeper. He started sleeping through the night around 8 weeks and consistently sleeps 7:00pm-7:00am. I attribute a lot of that to just the fact that he likes he sleep but I'd like to think we helped out a little with our predictable bed time routine and certain sleep essentials! These are the things we have used over the last year in the sleeping department that I think would make a great addition to any baby registry. 2. After he started rolling over we switched BT to do the regular Halo Sleep Sack. He used this for a few months until he started getting hot in the middle of the nights in the summer. I tried to put it back on him recently once it started getting colder but I think he prefers to sleep without it now. Regardless we loved it when we did use it! 3. Angel Dear Blankie. Bennett literally cannot function (or sleep) without his "lovie" in sight. We gave it to him in the hospital and it has not left his side since he was born (seriously.. if you know him, you know how true this is). 4. Since our house is really small and Bennett's bedroom is super close to our room and the living room we knew it would be important to block out as much sound as possible. For a while we used the Sleep Sheep as a sound machine but after a few months it started cutting out and even after changing the batteries a few times it still didn't work as well. We ended up getting THIS sleep machine recently and we love it! It has tons of different sounds and projects images on the ceiling. I usually put the images on right when I put him down and will turn them off after about 10 mins. The sound will play all night though. I keep the sound machine right near his door so I don't wake him up when I turn the projector off. We have typically used white noise in the past but recently started using lullaby music too. He likes both and sleeps well with either. 5. Bennett has been sleeping in his room since he was about 4 weeks old and it's probably only because I could see him on our video monitor. I love that this one has such a big screen and has a night vision camera so I can still see BT even when his room is completely dark. 6. Bennett's room is typically really dark because of where it's located in our house so I have never really had a need for black out curtains but I will say they are worth registering for if your baby's room gets a lot of natural sunlight. Whenever we get pregnant again we will definitely need them since the other room gets a lot more light. **This is not necessarily something you might put on your registry but I would definitely recommend reading the Moms on Call book (& getting the app!). We used their schedules from the beginning and it helped me so much know what to do. As a new mama I had no idea what I was doing so it was nice to have some guidelines and a schedule to follow, especially for sleep training. Now our boy is predictable and scheduled and it makes our lives so much easier. As he's getting older we're able to ease off the strictness of a schedule but we still know what he needs and when he needs it. I have several friends who are expecting right now and a lot of them have reached out to me for help with their registries. I know I am only about a year into this whole parenting thing but I definitely feel like I can be a good source for the must-have items for baby (+ mama!). Victoria asked me to blog about it and I figured this would be helpful for others in my life as well. I'm going to break it down into several categories/posts since there really is SO much. I'm going to start with all the essential baby "gear" today. I'm going to link to as many products as I can. 1. The infamous MamaRoo. Worth every.single.penny. We used ours up until about 9 months. 2. Car seat/stroller selection is extremely important. I went to Buy Buy Baby and "test drove" every single stroller they had. I ended up getting the Britax B-Agile Travel System with the B-Safe car seat. This stroller is light weight and easy to fold up. We can fit it in the back of our Tahoe with the third row in, which says a lot! Also, it would be smart to register for 2 or 3 extra bases for the infant carrier. It made it a lot easier for Adam + our parents to take Bennett places without having to take the base out of my car. Along the same lines, a backseat mirror is a must. THIS Britax mirror is my favorite. 3. Not as necessary, but we did end up going ahead and getting a double stroller for future babes. I like the Baby Jogger City Select because there are literally a million different ways to configure the seats. We went ahead and got two seats and the infant carrier attachment. I actually use this stroller a lot right now with just one seat on it. The basket underneath is incredibly huge and fits a ton of stuff. I love using it when were shopping since it holds so much. The only downfall to this particular stroller is that you have to take the seats off to fold it up. It's not a big deal, and doesn't take a long time, it's just not as convenient as other strollers. 4. Rock-n-Play. This was something we didn't originally register for but I wish we would have. I think we ended up getting it when BT was a month or so old. It was just another great option for a place to put him when we needed to shower, eat, etc. He would occasionally take naps in there as well. 5. We used the Bumbo a ton from month 2-5. After that Bennett's legs wouldn't even fit in it. I would still suggest registering for it because it was really nice to have during those months. 6. If there is one seat to register for it's THIS one!! The Fisher Price Sit-Me-Up Floor Seat is used in our house every single day. 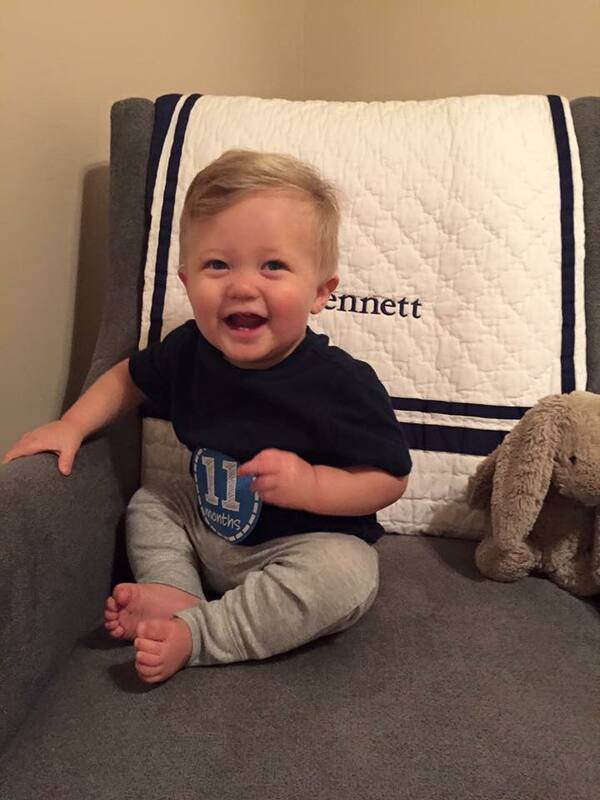 Even at almost a year old Bennett will still sit in his seat. We keep it in our bathroom and use it when we need to shower/get ready. He is content for at least 20 minutes (longer when he was younger). 7. We bathe Bennett every night as a part of our predictable bed time routine (bath, bottle, book, bed). For the first 7 months we used a baby tub in our big bath tub. This made bathing so much easier! I hope that was somewhat helpful. Like I said, these are the products we used and loved. Hopefully some of them will become favorites of yours as well. I'll be back next week with sleep essentials! nicole and I have been talking about getting new tattoos for a while now so when I was in mississippi last week we decided to go for it! 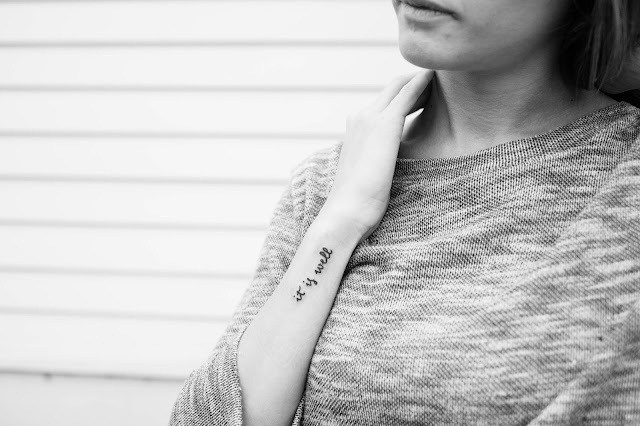 this tattoo has so much meaning for the current season adam and I are in and it is such a sweet reminder that no matter what situation comes our way, it is well. we can fully trust in jesus that his ways are far better than anything we could ever dream. we have been walking down a really hard path that I never imagined we would face, but through it all I have been shown so much love and grace. I'm thankful for friends that breathe life into me and encourage me to continue trusting. The countdown to ONE has officially started! I cannot believe we are only a month away from Bennett's first birthday. Honestly, I cannot believe that this time last year I was ridiculously huge and preparing for his birth. 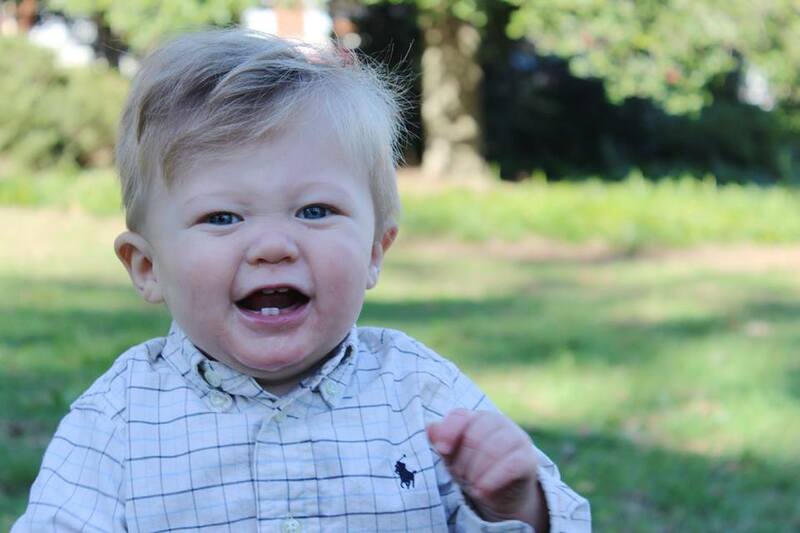 Weight/Height: At his 9 month appointment Bennett was 20lbs (30th%) and 29in (98th%). Ever since Bennett started crawling/walking he hasn't been putting on wight as fast ; ) He is tall and skinny according t the charts but definitely still looks like a linebacker to us!! Hair: Bennett had his third haircut this month. He still hates them and screams the entire time. Lolly pops didn't even work this time! Clothes: BT pretty much lives in sweat pants/onesies during the day. Our favorites are from Gap and Carter's. If we go out of the house I will put his blue jeans (Gap) and a cute shirt on him with his Freshly Picked Moccasins or Nike's. Diapers: Size 3 but will definitely be getting into 4's soon. Sleeping: Usually 7:00p-6:30/7:00a. Although the time change has really messed with his sleeping. We're hoping it is short lived and he will get back to his regular times ASAP. Likes: Books, food, playing outside, & playing with his doggies. Eating: We officially took Bennett off formula at the end of the month. He had been refusing it for a few weeks and was not drinking nearly as much as he usually did. His doctor suggested we try whole milk and see how he did. He has done great and I honestly don't even know if he realizes what I did. We are also in the process of cutting down to one bottle a day. Sometimes he still wants one in the morning if he wakes up early but he usually takes a sippy cup and will have one bottle before bed. Milestones: Bennett is officially a WALKER! He is all over the place and there is no stopping him now. It is adorable. 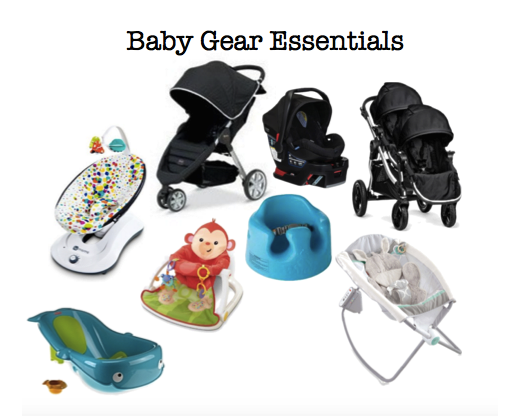 Baby items we can't live without: high chair, fisher price sit-me-up floor seat, stroller. I am so happy for November! I can't wait for the holiday season to get started. We have so much to look forward to in the coming months and I'm just excited. I feel like this season is going to be really good for us. 1. Take Bennett to the pumpkin patch We went to the pumpkin patch not once but TWICE : ) Once at home and again in Mississippi. 2. Have a fun family road trip Adam, Bennett, and I had so much fun with the Coles in Mississippi. 3. Enjoy Bennett's first halloween Halloween with Bennett was so stinking fun. 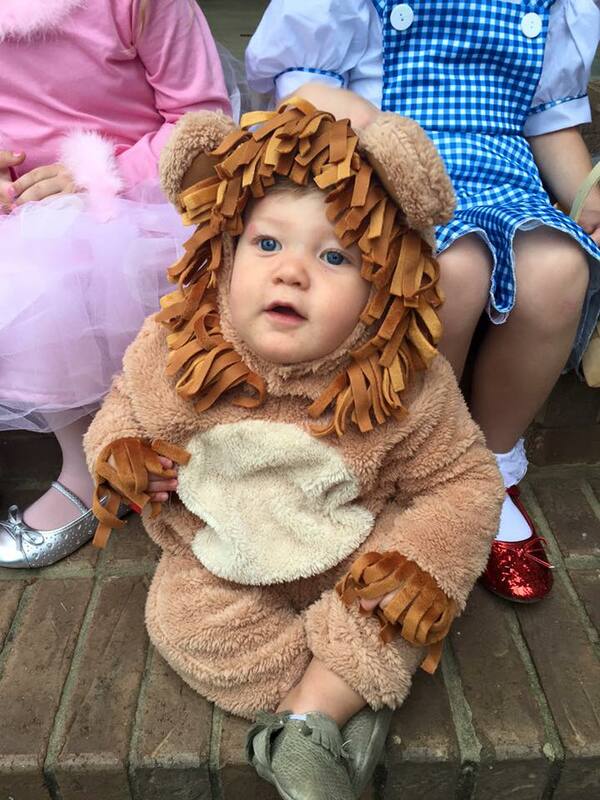 He loved all the attention he got in his costume. He didn't go trick-or-treating but he did get to go on a hay ride which he was really excited about! 4. Blog more I definitely did! 2. Plan + buy Christmas gifts. Ideally I'd like to be done with this after cyber Monday. 3. Decorate for Christmas while I'm on Thanksgiving break.